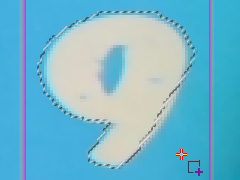 This tool allows you to snip an area of pixels from the active layer, which is then pasted into a new layer which you can then move around and edit as you like. It has several modes of operation, selectable from a popup menu. You can select an anti-alias mode for this tool. When anti-aliasing is enabled (default); all selections are cut out at the sub-pixel level to give you the highest quality results. 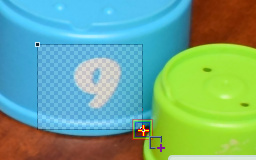 This option snips a rectangular area of pixels from the active layer, which is then pasted into a new layer which you can then move around and edit as you like. Click a start and end point. You can fine-tune the points by dragging them. Right-click (or press Enter) to apply. The size of the area can be controlled using the snap-to-grid feature, in which case the tool will correct the box size to always be a multiple of the grid size. This option snips an elliptical area from the active layer, which is then pasted into a new layer which you can then move around and edit as you like. 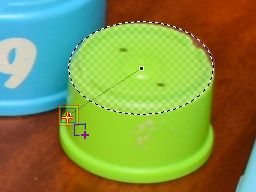 Click in the center of the object you want to select, then click a point at the edge. You can fine-tune the points by dragging them. Right-click (or press Enter) to apply. The size of the area can be controlled using the snap-to-grid feature, in which case the tool will correct the box size to always be a multiple of the grid size. This option snips an area of any geometrical shape using connected lines. The area is selected from the active layer. Click on the image with the left mouse button to set points, then click with the right mouse button to end the shape. The snipped pixels are pasted into a new layer, which you can then move around as you wish. This option snips a free-form area of any shape. The area is selected from the active layer. Click on the image with the left mouse button and drag to set the shape; the shape is ended when you release the button. The snipped pixels are pasted into a new layer, which you can then move around as you wish.